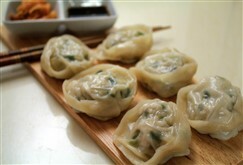 Mandu is the Korean version of dumplings. Mandu is a mixture of meat and vegetables stuffed in thin dough wrap. It can be steamed (jjinmandu), fried (gunmandu) or boiled (mulmandu) and is usually served with a sauce. 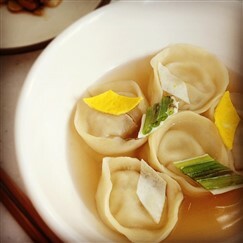 Mandu can also be added to beef broth to make Mandu-guk. Mandu is a versatile meal and can be served as lunch, picnic meal or light snack. Mandu is a big part of the Korean New Year Festival. It is usually made in largebatches and kept in freezers for future consumption. Mandu is made from rolled flour filled with minced beef/pork, tofu, eggs, onions,ginger, garlic and salt. Zucchini, cabbage and other vegetables can also beadded to the filling. The wrap is then boiled, fried or steamed. The accompanying sauce is made from soy sauce, vinegar and chili. Kimchi is also a common accompaniment to Mandu. Kimchi is sometimes used as a filling to make Kimchi-Mandu which is spicier than other versions of Mandu. Somandu is also a Mandu filled only with vegetables. It wasoriginally eaten at Buddhist temples but is fast gaining ground in the vegetarian community. Dumplings. They sometimes leave a bad breath if they used to much green onions. Fried they're the best I think. Skip anything that was previously frozen, or where you can't see the owner making it. 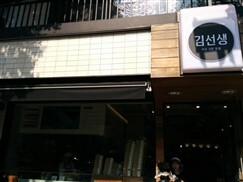 Most places proudly display their mandu making station(s), so just hit them up. SO good and cheap cheap cheap.